Partner with Hadassah to fill the new Tower of Healing with the latest medical technology and equipment for innovative trauma, pediatric and heart surgery, patient care, and courageous medicine in every field. US $25 : Help to furnish a comfortable patient room. 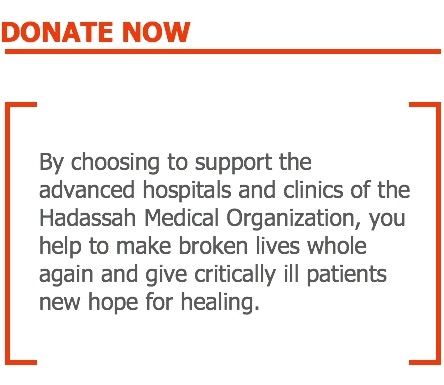 US $50 : Help Hadassah create healing gardens within the Tower to speed patients’ recovery. US $100 : Enable Hadassah to create proper laboratory space for breakthrough stem cell research and genetic discoveries. US $250 : Enable Hadassah to build the infrastructure for advanced imaging in the operating rooms, robot-guided surgeries, cutting-edge monitoring, and telemedicine. US $500 : Help Hadassah offer its patients a modern facility with more privacy, spacious sitting areas, and a comfortable place to consult with their physicians. Surprise Us: Contribute to Hadassah’s promise to serve the people of Israel—and the world—for the next hundred years with world-class healing and research. Help provide the latest technology for the new Hadassah Tower of Healing.